Can We Talk About Removal? 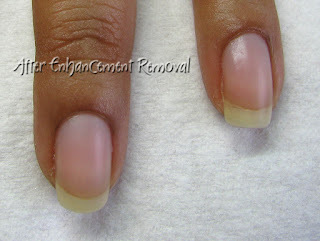 Clients ask me frequently how to remove product from their nails themselves. I advise against this and here's why. Many products such as gel polishes and professional liquid and powder systems (also known as "acrylic") are removed by dissolving them from the nail. This is a perfectly harmless procedure when done properly, by a professional. Other products such as hard gel enhancement products need to be filed off the nails. They aren't porous, so they will never soak off. Most people don't have the patience it takes to plop their hands in a bowl of acetone or product remover and just. sit. there. and. let. the. product. do. the. work. !! 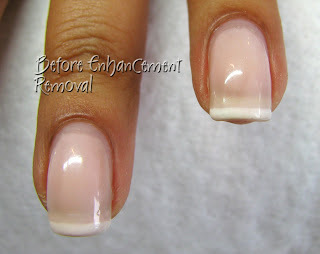 Most people will pick and pry the product off their nails long before it completely dissolves. It's human nature, and I get that. But what that ends up doing is wrecking your nails. And that's when I hear the stories. "Fake nails wrecked my nails". "My nails were ruined !!!" "It took me MONTHS to get them back to normal". So if you're getting your nails enhanced with either liquid & powder, or gel enhancements, please make an appointment to have them safely and professionally removed by your nail technician. Most professional nail techs will be more than happy to make this appointment for you because it means you know and understand that you've entrusted them to take care of YOUR nails. The same goes for gel polish. Do not pick or peel it off your nails. Pictures are always worth a thousand words so take a look at the before and after pictures of one of my clients' Shellac manicure. Regardless of whether we're removing Shellac, another gel polish, traditional hard gel or liquid & powder, I take great care to ensure their nails leave looking just like this after we remove the product. And you should expect these results too, from your salon professional. I'm a firm believer in life-long education, in whatever form that takes. One of the best parts of being in the beauty industry is the opportunity to attend trade shows, seminars, hands-on classes and networking events with my peers and industry leaders. It's something I'm passionate about, as most of my clients know. Not only do I feel it is important to stay on top of ever-evolving trends and techniques in the industry, it truly inspires and re-energizes me, and keeps me connected. Since most of the great nails shows are not held in Canada, I have partnered with another nail tech to host one in Southern Ontario every November. It was her dream to start an event 'for nail techs, by nail techs' to focus on bringing the knowledge of popular brands and education right to their doorsteps without the investment of so much money and time off for travelling. I am proud to say this year together we will host the Fourth Annual CNTC Nail Tech Networking Event in London, ON on Sunday November 4th, 2012. If you are a nail tech reading this and you live in Ontario, you NEED to get to this show. We have negotiated an excellent room rate with the Ramada Inn in London, which is where the show is being held this year. Arrive Saturday and attend our informal and fun Meet & Greet in the hotel that evening! Then get ready for a fabulous day of door-prize giveaways, nail art, demos and making lots of new friends in the industry. Here are the details. We also have a Facebook Group - do a search for CNTC and you'll find us. I hope you will join us this year! Do you have the desire to expand your professional horizons? Learn new techniques and mingle with like–minded techs? Join us at this upcoming Networking Event! Offer your clients the best possible service and care. Don’t miss the demonstrations of Gel Nails, Acrylic Nails, Nail Art, Gel Polish and Guest Speakers! Join us for an exciting day of Networking, Speakers, Guest Educators and Lots of Door Prizes! Refer a friend and get your name entered into another draw....the amount of entries varies on how many friends you refer! to set your services apart from other salons! For nail technicians – by nail technicians! EN VOGUE SCULPTURED NAIL SYSTEMS Inc.
With more to come as they are confirmed!